Disc-based games are played in 58 countries around the world by thousands of athletes. The World Flying Disc Federation (WFDF) said it was "honoured and humbled" by the IOC's decision to grant it full recognition. "This is an incredible milestone in the 30-year history of WFDF," it added. "Today's decision will give a further boost to our efforts to increasing the presence of Flying Disc sports in all countries and on all continents." The announcement was made at an IOC session in Kuala Lumpur on Sunday. 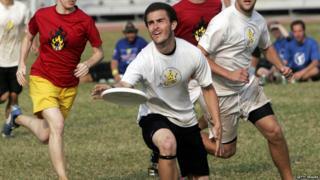 The WFDF governs several disc-based activities, including Ultimate Frisbee, Disc Golf and Freestyle. Ultimate, as it is more commonly known, is the most popular and originated in the United States in the 1960s. It is a non-contact, mixed-team game, played on a field or indoor pitch. Unlike the majority of other team sports, it is does not have a referee and instead relies on "sportsmanship and fair play", according to the WFDF.